You can’t have Batman on the big screen without the Batmobile, and from what we’ve seen so far, Batman v Superman: Dawn of Justice is going to give us a great version of the Caped Crusader’s wheels. Last September, director Zack Snyder posted an in-depth photo of what the car will look like, and there was a brief glimpse of the vehicle in action from last Friday’s teaser trailer. Now we have our most detailed look at the next live-action Batmobile thanks to Los Angeles Clippers center DeAndre Jordan - considered to be the biggest Batman fan in the NBA - being given a sneak peek. And the vehicle has plenty of new features that will make any Dark Knight fan start to salivate. Bleacher Report has posted a video of Jordan visiting the Batman exhibit at the Warner Bros. VIP Studio Tour Hollywood. To cap off this field trip, his tour guide gave the basketball star an up-close look at Batman’s wheels in Batman v Superman: Dawn of Justice. Jordan was the first person outside of Batman actor Ben Affleck and the rest of the film crew to see the car, and judging by Jordan’s reaction at the end of the video, it did not disappoint. The car, designed by Dennis McCarthy and Patrick Tatopoulos, is 20 feet long and 12 feet wide in the back. To use Jordan's words, it looks like a "tank, car and plane" combined. 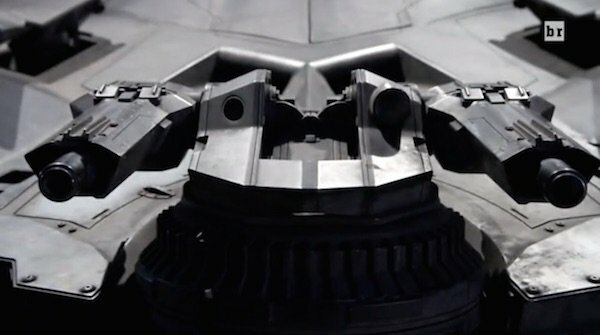 Among the unique features that separates this Batmobile from previous versions is that it rises when doing jumps, and goes lower to the ground when cruising. The car’s back tires are shaved-down tractor tires, which explains why they look so monstrous. The tour guide also pointed out what most of us instantly noticed when fans saw the first full Batmobile image: the machine gun turrets. 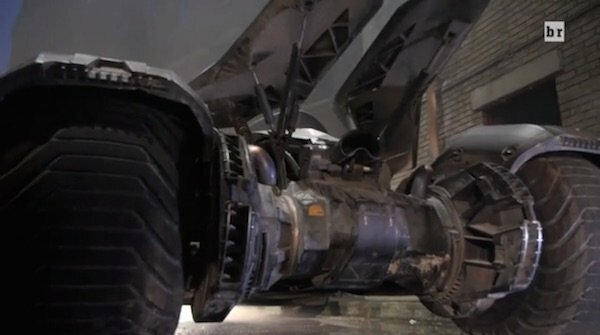 While this isn’t the first time that a Batman vehicle has had weapons attached, this is the first cinematic Batmobile that has guns in the front. However, given Batman’s firm stance against not killing, don’t expect the Batfleck to be gunning down criminals with them. Like with the Bat-Pod in The Dark Knight and The Dark Knight Rises, he probably just uses them to take out inanimate objects and obstacles. 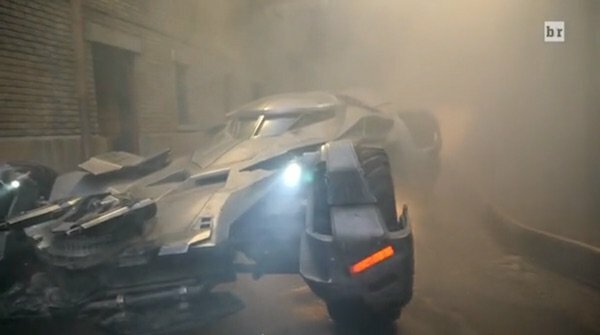 While fans will have different opinions about which Batmobile is the "best," it looks like the Batman v Superman: Dawn of Justice incarnation will be a fitting successor to the Dark Knight trilogy’s Tumbler. It may be a while until we get another good look at it, so commit as much of these facts to memory. You can check out the full Bleacher Report video below, which also includes some other details from the movie, and DeAndre Jordan trying fit inside the car despite it not being built for his 6’11" inch height.